An insurgent research group I am part of, visited Genva to meet with artists, academics and activists hosted by the CCC at HEAD (Haute école d'art et de design - Geneva University of Art and Design). This was a return visit after we had met and discovered overlapping research interests through an exchage trip to MayDay Rooms. We were both inspired by tributary diagrams, and the possibilities offered by tracing relations between the things we valued, especially in relation to resilience and the Anthropocene. In Geneva, after a first day of introductions and presentations - with an introduction to the idea of The Athropocene Atlas of Geneva (TAAG), we fractured into three groups and lead by our hosts, took to the city. Getting a sense of large scale climatic changes that have occured in the past, and that are expected to intensify in the future is not an easy task. Trying to understand how human activities are influencing these processes, and sensing them from a local perspective is also a challenge. The micro-investigations in the city proposed to focus on a series of indicators, indicators of long term climatic evolution as it was locally recorded, and groups and communities experimenting with resilience to the changes to come. The group I was part of began at 10am with a visit to the official Horse Chestnut of Geneva, the marronnier officiel. 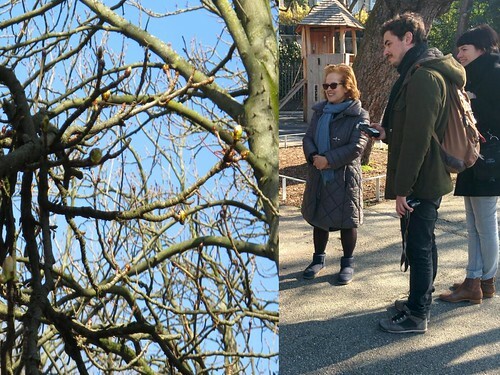 Here we met with Madame Maria Anna Hutter, the suatier of the Grand Council of Geneva, in late winter and early spring it is one of the duties of the sautier to pass the marronnier officiel and check for the first opened bud. Upon detection, the date of the bud is recorded, entered in an official ledger, and spring officially announced. On March the 10th, there were buds, but not officially open. The sautier has been carrying out this task since at least 1818. The weather, bud, sautier, and ledger assembly might be a good local indicator. Madame Hutter suggested that this part of her role, the declaration of spring, had a connection to ancient tax collecting rites - taxes paid to rent land in order to plant crops. Madame Hutter also connected her attentive looking to the notion of vigilance, as another part of her role is to ensure the smooth running of the Grand Council of Geneva, the legislative body of the canton. She mentioned a very uncomfortable chair, carved with a lion's head (previously people believed lions never sleep), that she has to sit on, inside the Council Chamber to remain alert and vigilant. Madame Hutter offered to take us inside the Council Chamber to see the ledger of the marronnier officiel. We followed. As we entered the Baudet Tower of the Town Hall (Hôtel de ville) Madame Hutter explained we were in the lobby, where people sat waiting to petition their representatives. In an instant the two meaning of the word (in English), an ante-room and the action of trying to influence political opinion, collapsed down to their shared root. We proceeded to the council chamber, a fifteenth century structure, with seventeen century frescos, and a futuristic Bond-villan style table and nine chairs. We marvelled. Set-back was the ledger, which turned out to be a thin, long scroll housed in a double sided cabinet-like object, like the housing for a pendulum in a Grandfathers clock. The scroll, rust coloured for the most part and written in a surprisingly casual hand did indeed start in 1818, under the title OBSERVATION. From 1982 bright white paper supersedes the rust, as blue biro does the pen. Its forward dated, but only to 2020. We were all stunned by the fresco's in the chamber. Above the table sat a group of seven bearded men with severed hands. Severed hands. Madame Hutter explained they were by Cesáre Giglio, painted in 1604 and entitled Les Juges aux Mains Coupées (Judges Without Hands). 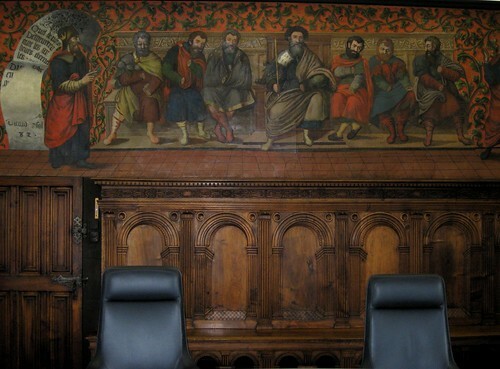 Previously, this room had been a court, and typical of post-Reformation custom, an example of justice was sought to decorate the place where the magistrates were to sit. The allegory for the magistrates is clear – justice ought not to be influenced by lobbying or bribes. We mused briefly on the state of lobbying and influence in current politics, especially in the field of climate change and its science, by fossil fuel companies. In the frescos, one of the judges has a hand, just one, and it's holding a mace. 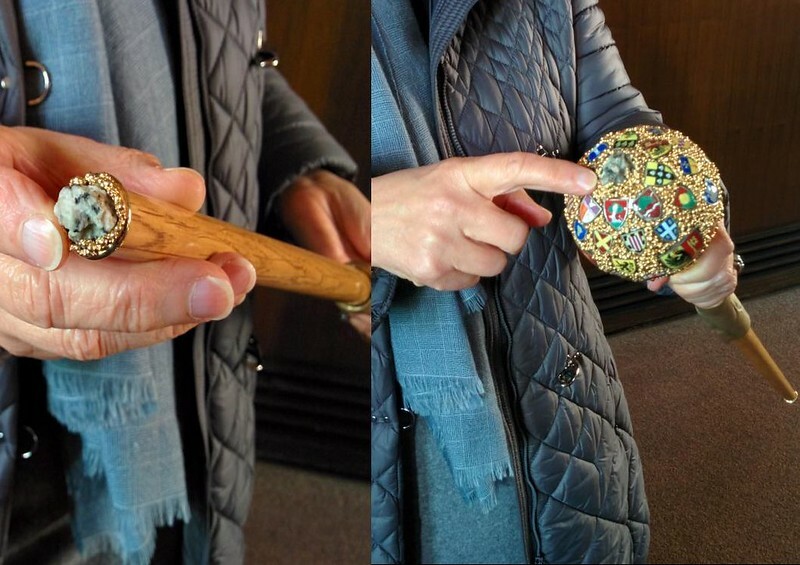 Madame Hutter explained that she too has a mace, to carry on ceremonial occasions, its encrusted with stones. At the top a stone from Mont Blanc, at the bottom from the pierres de Niton, and arrayed around one from each of the seven major rivers in Geneva. We wondered if we could see it. We could. Madame Hutter had it brought. Although our itinerary had mentioned the pierres de Niton (Neptune's stones), and earlier I had asked and someone had said they were rocks in the lake, lake Leman, I didn't know their significance. 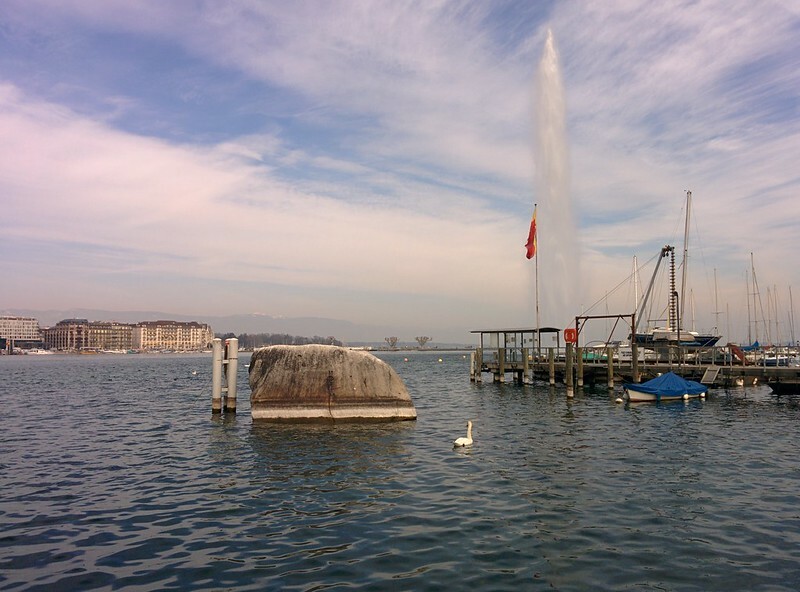 Madame Hutter explained, they are remnants from the last ice age, a so-called glacial erratic, and deposited in Geneva by the Rhone glacier some 22,000 years ago. The glacier is currently 179 km away. Glacial erratics are indicators of previous large-scale climate changes, and the Alps are where the first systematic scientific research on ice ages was conducted by Louis Agassiz (1807 – 1873) a Swiss-born biologist and geologist. In 1837 Agassiz proposed that 22,000 years ago most of western, central Europe and Eurasia were open steppe-tundra, while the Alps a solid ice-field topped by mountain glaciers. Madame Hutter had to go, our unexpected yet delightful tour was over, so we set off to see the pierres du Niton. Our schedule suggested an 11.30 meeting with geologist Eric Davaud, unfortunately he could not make it, this freed-up some time...........hmmm. We decided to take a ferry across the lake – good views of the rocks, have lunch outside in the early, yet unofficial, spring sunshine by the bathing area, and then stroll along the lake to the Botanical gardens. This is what we did. We would still have time to return for our last meeting at 4.30. Animated, we walked back into the heart of the city, for our last appointment with Professor Martin Beniston at HEAD. Martin is a climatologist, director of the Institute for Environmental Sciences <Battelle>, and Nobel Prize winner for his contribution to the Intergovernmental Panel on Climate Change (IPCC) Report in 2007. 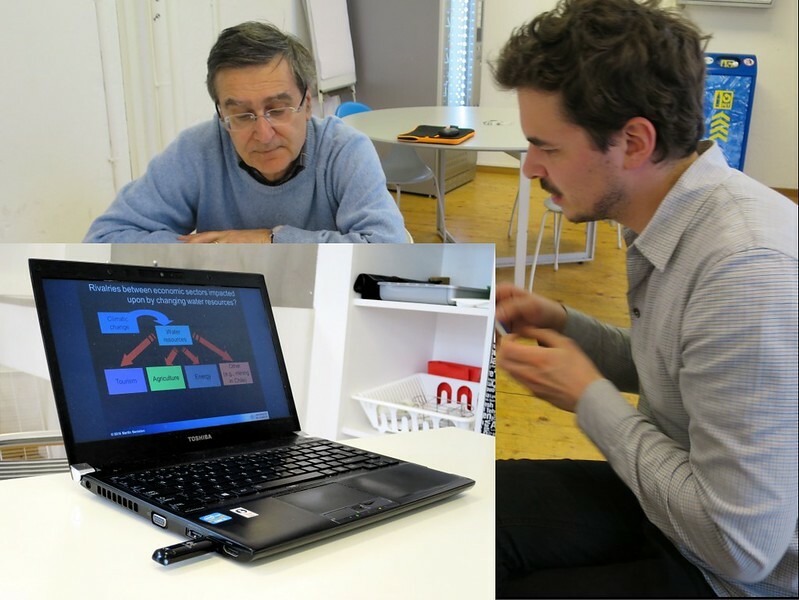 We sat around a small table and looking at images and animated models on Martin's laptop, were treated to an hour-long masterclass on the causes, evidence for, and effects of global warming. Martin was clear, precise and when tasked by simple questions from non-specialists, gracious in his responses. We moved slowly through the visualised statistics and models, Martin's science background framing everything within probable parameters, calmly citing evidence, and patiently explaining possible consequences. It was like a doctor explaining you have a terminal disease. The evidence is overwhelming, the effects devastating; prolonged droughts, frequent floods and increased storms - although unequally distributed, as is the will to change our behaviours. Martin undelined the fact, that this will be no linear increment in change, complex feedback loops will trigger intense, violent and largely unforseeable effects. The presentation over, we discussed the difference in geological or climate time, and our political cycles. One degree of warming in a century doesn't sound a big change, and its current effects on individuals imperceptible. Where are the incentives for political classes to act, when they will not benefit from the consequences. They just want to cling close to power, now. Severed hands leapt to mind. Martin suggested modelling change through time could also be a problem, a century is beyond most human experience. Difficult to comprehend. Recently they have begun experimenting with modelling through space. Geneva currently, has the climate that Toulouse had in the 1950's, and Toulouse currently, of Madrid in the 50's, and Madrid that of Sevilla in the 1950's, and so on. Our climate is drifting north, one degree, roughly ten kilometers every year. Woah, that was powerful. A slow wall of warmth, advancing. A negative glacier. We also discussed some of the parameters of possible change. Martin thought the two degree limit, as agreed by UN nations in Copenhagen in 2009, by the end of the century as unrealistic. He thought close to four probable, six possible. At four there would still be some winners - farmers in Canada, and loosers - vast populations in the Ganges Delta, Sub Saharan Africa, and anything in the tropics. And, as a worst case scenario, nearing six degrees of warming there are no winners, we would be hurtling towards extinction. 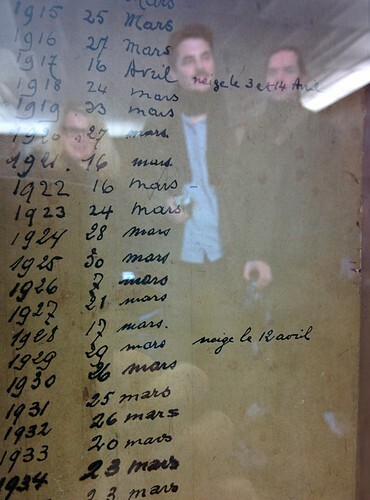 We asked Martin about the record of the budding of the Marronnier Oficiel, was it likely to be a good indicator? We showed him the tabulated dates, he scanned them, hmm he said "There seems to be a surprising amount of correlation". Finally, after one of the most memorable hours of my life we asked Martin what he thought our erratics would be? Obviously carbon dioxide, that will be around for a very long time, nuclear waste too, and after a short pause, he offered plastics. We left, a bit stunned. No, stunned. This account is related to Tracing Values, inspired the Anthropocene Walk, and the Live-tracing event.